A standoff over funding for President Donald Trump’s long-promised border wall has resulted in the longest-ever shutdown of the US government. Mr Trump argues $5.7bn (£4.5bn) is needed to address a “humanitarian and security crisis” at the southern border and has warned the shutdown will continue until he gets the cash. Democrats say the wall is a waste of taxpayers’ money and accuse the Trump administration of creating a “manufactured crisis”. 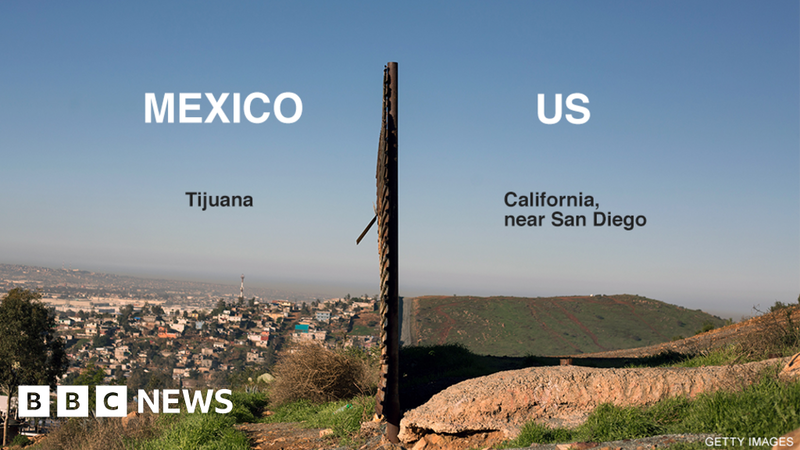 Here are seven charts and maps that try to explain where we are with the wall and what the situation is like at the US-Mexico border. Before Mr Trump took office, there were 654 miles (just over 1,000km) of barrier along the southern border – made up of 354 miles of barriers to stop pedestrians and 300 miles of anti-vehicle fencing. In the run-up to the 2016 presidential election, Mr Trump promised to build a wall along the border’s entire 2,000-mile length. The first construction on any extension to the existing structures – what could be termed new barrier – will start in February in the Rio Grande Valley, Texas. Despite Mr Trump’s continued determination to see a wall along the border, a survey this month by the Pew Research Center suggests the majority of Americans – 58% – oppose substantially expanding it, while 40% support it. A number of widely different estimates for a concrete wall have been put forward by official and unofficial bodies – ranging from $12bn to $70bn. The 650 miles of fencing built under President George W Bush cost an estimated $7bn, and it could not be described as fulfilling Mr Trump’s promises of a “tall, powerful, beautiful” barrier. However, Mr Trump is now asking for $5.7bn in addition to the $1.7bn already allocated for new and replacement barriers. The Department of Homeland Security (DHS) previously estimated a wall spanning half the border would cost up to $25m, but it has now said it is still looking at options to determine the price tag. Mr Trump has changed his view of what constitutes a wall. His promise to build a “big, beautiful wall” between the US and Mexico was a rallying cry throughout his election campaign. And early on, when he described it, he talked about concrete. But once elected, he began talking about a barrier made of steel, so that border agents could see through it. And in October 2017, when the Trump administration revealed eight 30ft-tall wall prototypes – they were a combination of concrete and metal. Officials at the US Customs and Border Protection agency have said none of the Trump administration prototypes tested in 2017 met its operational requirements. However, they did provide “valuable data” to help select design elements in the future, they added. Mr Trump said in a national address in early January that a wall was needed to stem a “growing humanitarian and security crisis at our southern border”, involving “thousands of illegal immigrants”. In exchanges with House Democratic Leader Nancy Pelosi and Senate Minority Leader Charles Schumer, Mr Trump also said that people were “pouring into our country”. In 2000, 1.6 million people crossed the border illegally, while last year that number was just under 400,000. In 2017, Mr Trump’s first year in office, they were the lowest they had been since 1971. Every congressperson along southern border opposes the border wall, arguing it would not improve security. Between 2017 and 2018, arrests – the number of people apprehended by authorities – on the Mexico-US border rose by about 100,000 and asylum claims rose by about 16,000 – up 43%. Among these groups were a rising number of families fleeing violence in Central America and surrendering themselves to US authorities at the border. Many have told officials that they fear returning to their home countries. Some have blamed the decision to slash the number of refugees allowed into the US under the Refugee Admissions Program for the rise in such claims for asylum at the border. Such claims are then referred to the Asylum Officers of the US Citizenship and Immigration Services. And despite Mr Trump’s claims, any new border barrier is unlikely to stop these migrants legally claiming asylum at a port of entry. Although Mr Trump has blamed the southern border for illegal immigration, most actually arises because people overstay their visas. While almost 400,000 people were apprehended trying to cross the southern border illegally last year, more than 700,000 people who entered the US legally overstayed their expected departure date in 2018, according to the DHS. Canadians were the highest group of overstayers, according to DHS figures, followed by Mexicans and Brazilians. Although the number of overstayers overall dropped to around 420,000 in May 2018 – it was still more than the number of people arrested trying to enter illegally via the Mexico-US border. Design by Sandra Rodriguez Chillida.